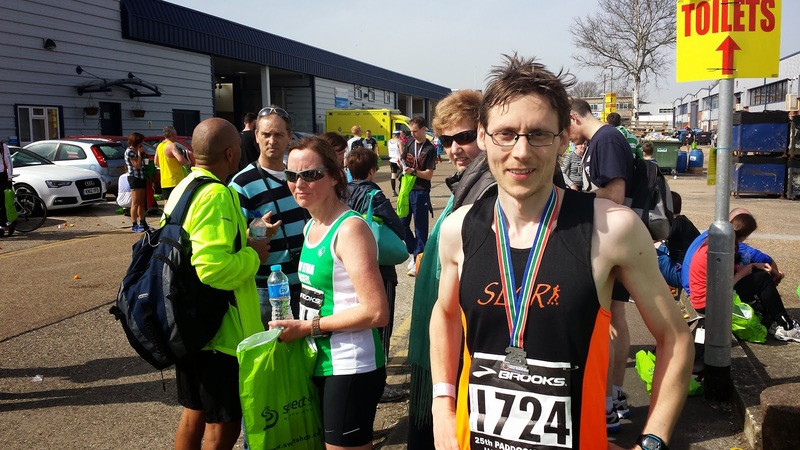 I was supposed to run the Paddock Wood Half-Marathon back in 2012, but my running wasn't going so well and I made the decision to sit it out. Fast-forward to the end of 2013 and I finally felt that my training was in a good place, so I coughed up the cash and put my name down for the 2014 event. All was silent until one day at the beginning of March and an envelope popped through my door from Sports Systems. I recognised it from the last time I had entered. Enclosed were my race number, timing chip, race day instructions, course map and a baggage tag. This was my second race where I would be representing the 'So Let's Go Running' running group, so I had already attached my number to my SLGR singlet and was looking forward to representing the running group again (the first time was at the Knole Park 10k). The weather forecast was for a dry, partly cloudy day with the temperature at around 13 degrees at race start time, rising by a couple of degrees shortly after and the wind was at most just a fairly light breeze. 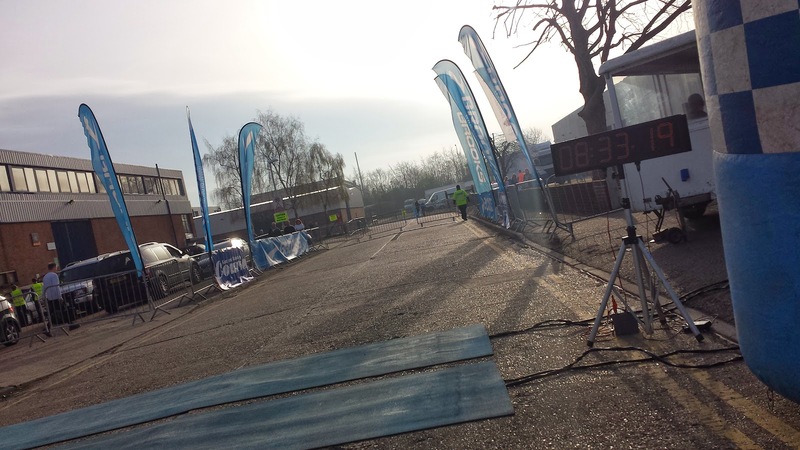 The Paddock Wood Half-Marathon is a popular event and 2014 marked the 25th year that it had been run. 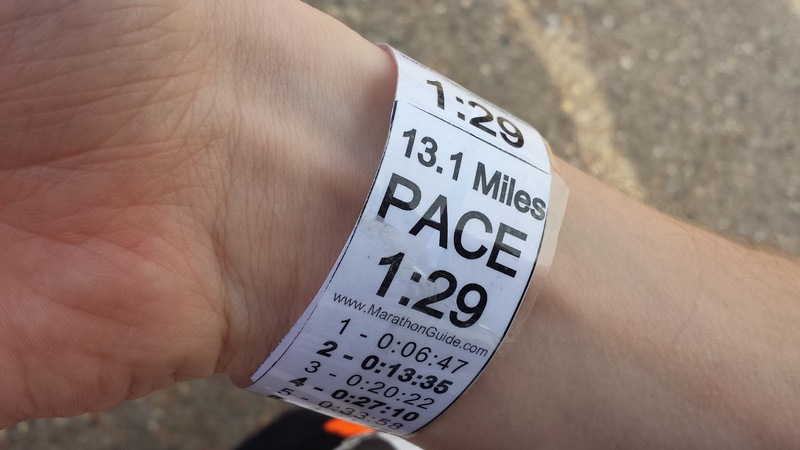 The course is described as being a flat PB course, and my goals were based on this. 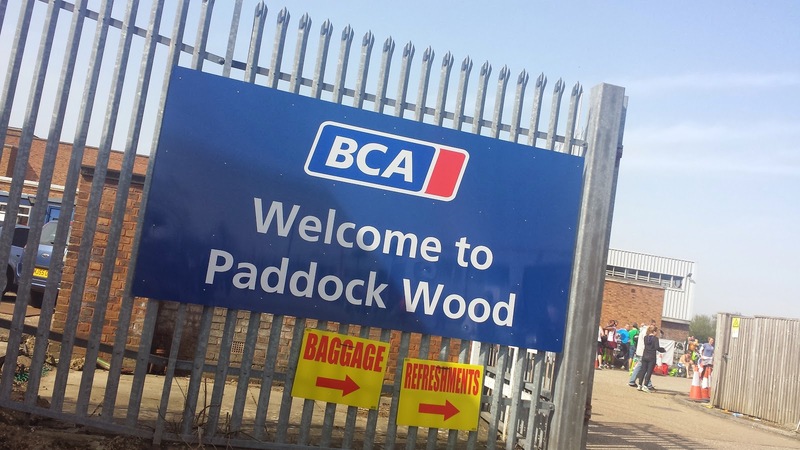 Upon arrival, I parked in the main event car park which is in an industrial estate. There were other parking options including the train station, but there also seemed to be some other third-parties offering parking for a price. The only possible downsides with the official parking were... A. There aren't very many spaces so you have to arrive early. B. You can't leave until almost every single runner has completed the course, this is because the car park is located behind the finish line and there is simply no way out until the road re-opens. 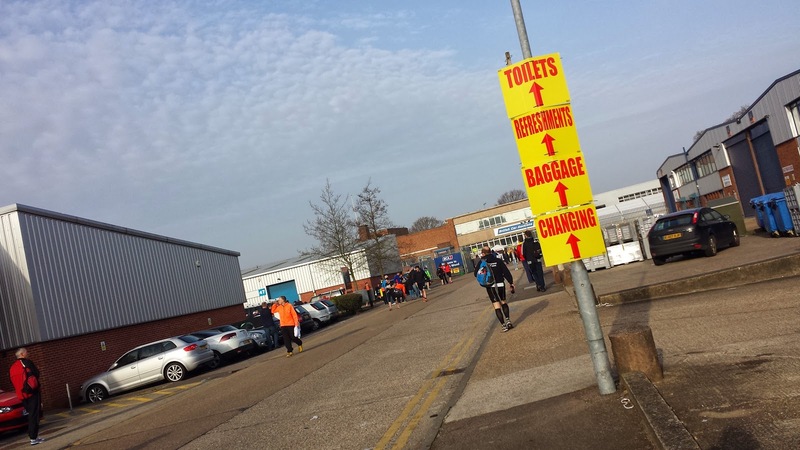 There were a bank of toilets, male and female changing areas, a bag drop area, an official t-shirt stall, a medal engraving stall, and a shoe stall. It wasn't until I was being nosey around the official t-shirt stall that I noticed that the back of the t-shirt featured the names of every runner that had entered the race - really cool, I thought. So after an unintended extended warm-up jog to a cash point machine, I coughed up the £10 for one. The course is almost completely flat. Every now and then there is a little undulation to deal with, but I found that I was able to maintain the same pace without too much trouble. During the route around the countryside outside of Paddock Wood the scenery is pretty much exclusively farmland. The course does go through a couple of smaller villages and there is some great support on offer. There were four water stations and an additional two water sponge stations on the course. 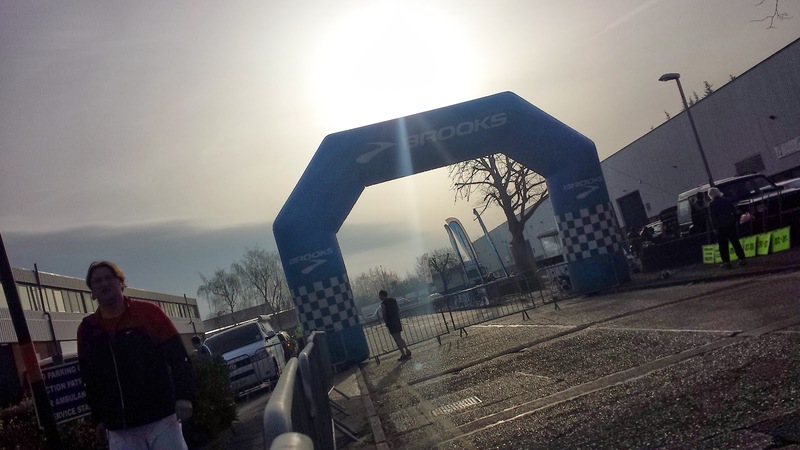 The race start time was 9.30am. At 9.05am I got in the queue for the toilets. At 9.27 I finally got to the front of the queue. So by the time I reached the start area, I found that I had to start a long way further back than I had intended and had something like 1,000 people in front of me. Once the race had been started, it took a full two minutes for me to reach the start line. So, the toilet situation is going to be my only gripe about the race - The amount of toilets (I think 31 of them plus a urinal) did not seem enough for the amount of runners. Once I was finally on my way, I immediately started trying to filter through the crowds. It wasn't easy and it worked out that I was about 30 seconds down when I reached the 1 mile marker. It would have been easy to panic and try to get back on pace straight away, but I knew that that would most probably put me in a bad state towards the end of the race, so I kept to my intended pace plus a little extra when it felt right and kept my eye on my splits in order to try to gradually get back on track. It worked out that throughout most of the miles, I remained about 20 seconds adrift of my times for hitting each mile marker. I knew this because I had used the Marathon Guide website to create a wristband with my goal time as being 89 minutes. My original idea was that I would start the race in the correct zone and try to remain well under the times listed. Anyway, the plan had changed and that was fine - these things happen. I passed the half-way marker at 45.01 - I had hoped to be there a touch earlier but I felt strong and was confident of finishing in under 90 minutes. Finally at about the 8 or 9 mile point, I had started hitting the mile markers at the split times listed on my wristband. It had taken almost an hour of patience but I had caught up. Just after the 10 mile marker, I felt like it was time to start increasing the pace. Each of the last 3 kilometres were progressively faster than the last and although I was starting to feel a little tired, I was able to keep pushing right until the end. I crossed the finish line with the gun time showing 1.30.43 (90.43), but with the two minute delay at the start, my actual half-marathon time by chip was 1.28.44 (88.44). So I had achieved both goals that I had set myself. I was given a goodie bag and my medal, the water in the goodie bag was much appreciated after the warm weather conditions. 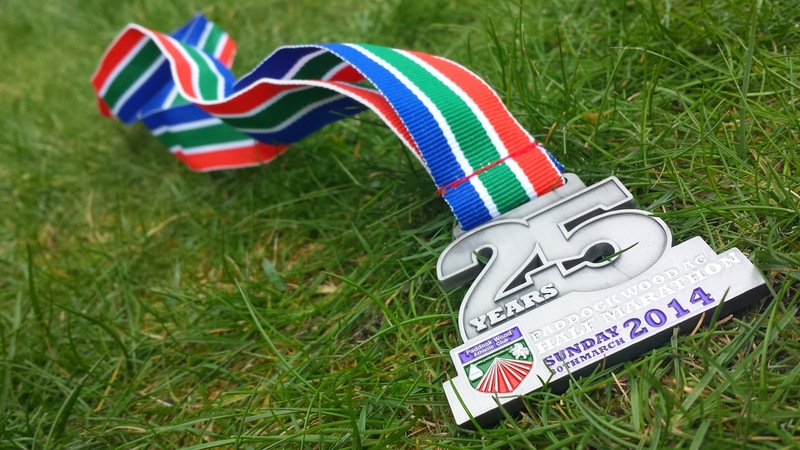 The medal is probably my favourite medal to date - They had their own bespoke design and with this being the 25th running of the event, it was pretty special. This was a very well organised and brilliant race. The marshals were all friendly and the signage around the course ensured that there was no way of getting lost. The t-shirt with the names of all of the entrants printed on the back was such a brilliant idea and I'm glad that I bought one. From those points of view I would almost certainly enter this race again. I'd just ask for some extra toilet facilities to be provided to try to prevent the queue from building up so much. The timing was taken care of by Sports Systems. I recieved a text message a few hours after the event containing my result. They were also published online later that day. By gun time, I was 217th out of the field of 2070. After looking at the results in more detail, 41 people finished in front of me but with a slower chip time and one person behind me finished quicker than me. So I think that works out that I was 177th out of 2070 if you base it on the chip times. Looking at my GPS data from the race. I'm happy with my nice even split times throughout the race. Obviously apart from the 1st where I was busy filtering and lost some time. The GPS readings brought the course out a little long but I was taking a lot of the corners wide in order to pass people on my way around, so I expected this. My fastest kilometre of the race was the 21st, which I managed to run at a pace quite similar to my current 10k race pace - It makes me wonder if I took it a little too easy.